Chris Brandt (Pare) is a high school basketball coach from Ohio. His brother Craig (also Pare) is a Marine who was kidnapped by Lebanese terrorists. Running into a wall of red tape from the government, Chris travels to Lebanon to fight the baddies and rescue his brother. Once in Lebanon, he teams up with the classic wacky taxi driver to get results. He also finds time for a romance with government employee Sandra Ross (Runyon). But Charlie Wolff (Lamas) keeps telling Chris to go away and mind his own business. Will the Brandt brothers make it out of the middle east alive? Here we have some classic Michael Pare woodenness - times two! Anyone who’s seen any of the five Van Damme movies where he plays a dual role knows that it’s done in the classic “Patty Duke Show” way where you see the back of one’s head, etc. Double Impact (1991) is probably the best example of that. But like we said for that film, “Double the Van Damme, Double the Running Time”, and that’s exactly the case here. Killing Streets is way too long at almost two hours. This extensive length not only tests the audience’s patience, but we would care more about the proceedings if it was at a sensible running time. 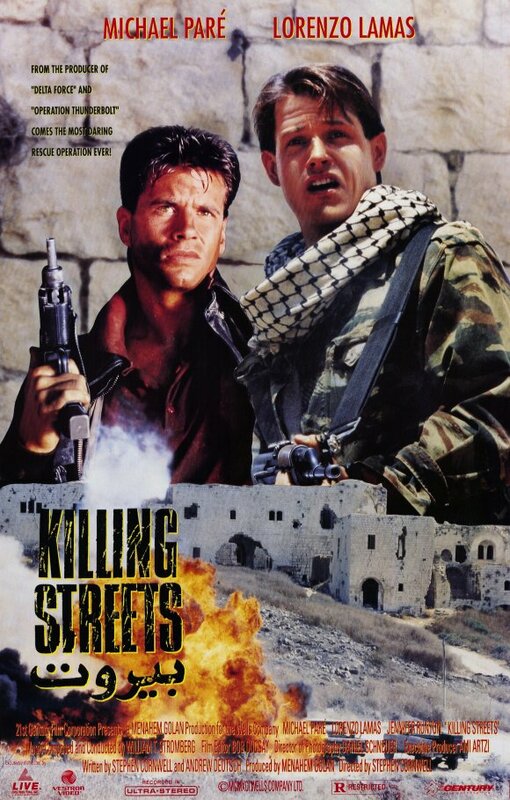 But our theory about this is, movies like Killing Streets are primarily made for overseas audiences, especially in depressed countries. These people don’t want to go back to their miserable lives, so every second counts when they’re sitting in a darkened theater trying to forget their troubles. So they demand longer movies as a longer escape. And Golan (of Golan & Globus fame) certainly delivers that. Pare looks like Michael J. Fox as Alex P. Keaton, Lorenzo Lamas doesn’t do all that much but he has a spiffy haircut and an unnecessary southern accent, and the wacky taxi driver is a little less wacky this time around. The main baddie should have been MORE of a baddie, and he also should have been played by Adrien Brody. 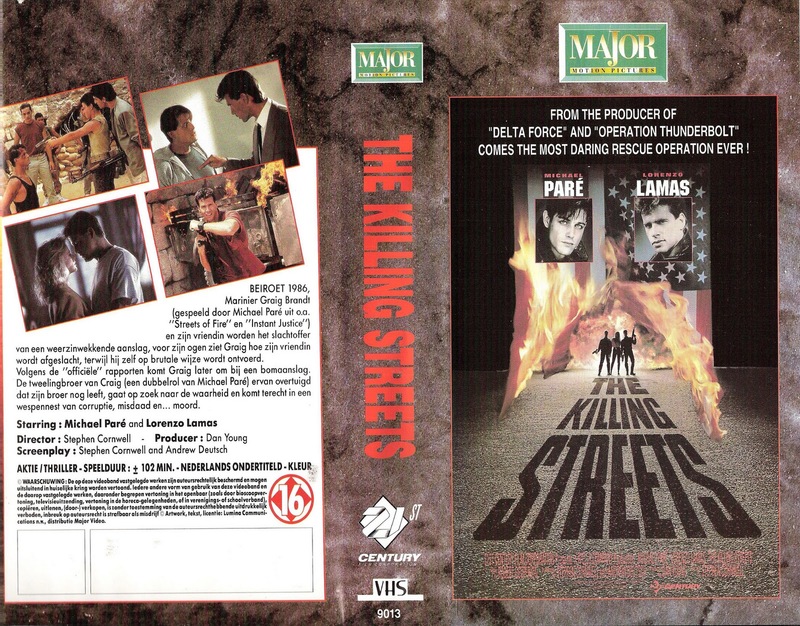 Killing Streets is an exact cross of two other Pare vehicles: Deadly Heroes (1993) and Instant Justice (1986) . It has the same middle east locations as 'Heroes but almost the same plot as 'Justice. In Instant Justice he’s looking for his sister. In Killing Streets he’s looking for his brother. Did they think fans wouldn’t notice the difference? Interestingly, BJ Davis of Laser Mission (1989) and White Ghost (1988) fame was the stunt coordinator and second unit director on this film. And what action there is, is good - there should have been more of it. But they should have cut a lot of other stuff to make room for it. 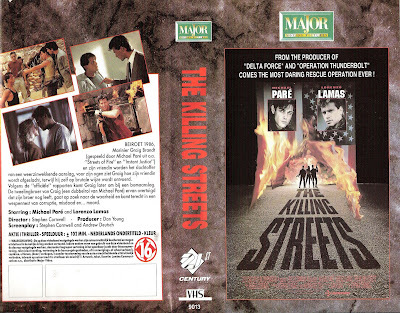 Don’t get us wrong, there are some cool parts in Killing Streets, but it’s an 85 minute plot stretched out to the breaking point. Killing Streets isn’t bad, it’s just too long. Remember seeing this one a lot at the local video store ages ago, but never picked it up. Looks like I didn't miss much. lol. Great review guys! Thanks! You're right, you didn't miss anything. There are some decent moments, but overall it wasn't that good. I have this tucked away for a rainy day marathon of Pare or Lamas (not sure which heading it'll fall under). I love Pare despite my better judgment, so the prospect of Two Pares for the Price of One is enticing. It is pretty fun to see two Pares!...that was the best part of the movie. Definitely interested in your take on it. Man, you were much more on the ball than me, I totally didn't plan anything for Lamas's birthday! I need to check this out, it looks better than The Debt, which also starred both he and Pare. I mostly agree with your review, this isn't one of Pare's or Lamas's finer moments, but not the worst either. Some interesting info, the guy playing the cab driver ended up reprising his role in the movie "Deadly Heroes" which also starred Pare, the car chase in this film was also re-used in that one. DTVC: Can't believe "Reno Raines" is 54 years old! Time goes by quickly. Definitely interested in your review on this, unfortunately it could have so much better, it they cut about 15 minutes from the running time. Venom: Definitely agree. Also yeah we also noticed it was the same wacky cabbie! Pare and Lamas, has got me sold all together and by the way didn't mind Undercurrent and Motocross Kids is priceless. They are a pretty good team. Undercurrent was a little boring, but Motorcross Kids sounds pretty funny. Will have to check it out!